Removing a tree is generally best left to professional arborists. Removal of mature, large trees requires experience and the right equipment. 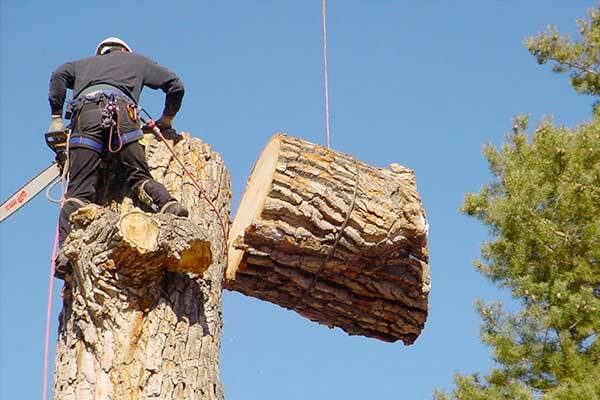 Tree removal service is our most requested service and the most complex. At Timberlake's Tree Service Chesapeake we have safely removed trees due to damage, disease, aesthetics purposes, and safety since our founding in 2001. We have removed most types of tree indigenous to the southern Virginia area. Our process for tree removal starts with a free on-site inspection of the tree(s) to be removed. We will come to your business or home to assess the nature of the removal and provide you with a free verbal quote right on your property. At that point, our office will follow-up with a written quote for the tree removal service, along with all of our licensing and insurance information. When we are at your home or business, we will assess the nature of the tree's condition, property structures nearby that will need to be protected, access to and from the area, and any other unique aspects of the situation. Tree removal prices generally depend on two factors: 1) the species of tree; and 2) the size of the tree and it's location relative to structures. The species of tree matter as some types are a bit more challenging to remove. Trees with multiple main trunks take a bit more planning and effort to remove vs. a tree species with just one main trunk. Further, the size of the tree is a significant factor as it goes directly to the effort involved to remove. Lastly, proximity to property structures is the final factor in determining price. Extra precautions to avoid structural damage adds to the price of a tree removal. Once you received the written estimate, we will follow-up with you to schedule the service and go over any other details not previously discussed during our on-site meeting. Prior to the schedule tree removal day, one of our customer service representatives will call you to confirm the time our crew will be on site to begin work. We will review all the details for the work order and ask if anything has changed and if you would like any other services discussed and quoted. We commit to a two-hour arrival window to be on your property and to start the job. Upon arrival at your home or business, our foreman will introduce himself, review the work order, and ask if you have any questions or concerns. If everything is in order, we will begin to remove the tree(s). Our process for removing trees from your property begins with our lead tree cutter either climbing (with the use of safety harness) or elevating in one of our lifts to begin the dismembering of the main limbs of the tree. Our ground crews are stationed at the base of the tree to both safely lower large limbs, and eventually section of the trunk, as well as cut up lowered limbs and clear brush to the wood chipper stationed at the nearest curb. This process continues as the tree is systematically reduced in manageable section until all that is left is the main trunk. The trunk will then be cut into manageable sections until we are at ground level with just a stump. Throughout this process, safety to your property structures and our crew is paramount. When finished the entire area will be cleared of all limbs, branches, sticks and other tree debris - leaving only the tree stump left. If you opted to have the stump ground, that will be subsequently schedule for a day or so after the tree removal. All the wood from the tree will either be stacked per your specifications or removed to our awaiting truck. When we depart, you property will be untouched less one (or more) removed trees. We are tree removal Chesapeake depends on for safe, affordable, and professional tree care. Call Timberlake's​ Tree Service Chesapeake today.